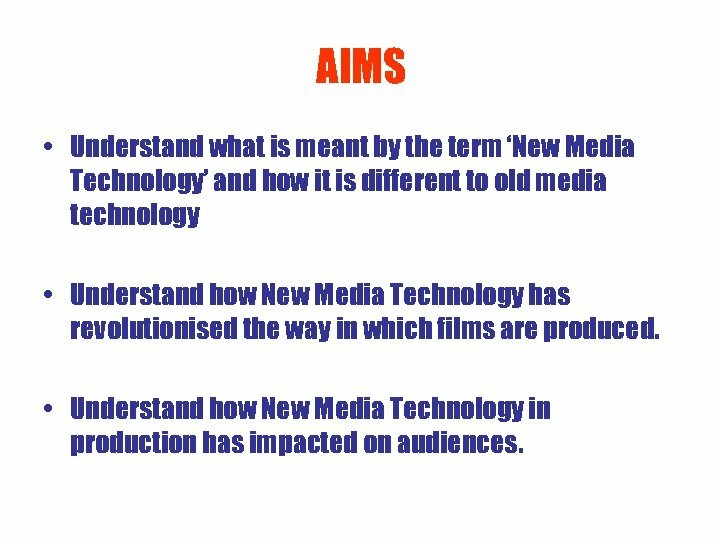 AIMS • Understand what is meant by the term ‘New Media Technology’ and how it is different to old media technology • Understand how New Media Technology has revolutionised the way in which films are produced. • Understand how New Media Technology in production has impacted on audiences. 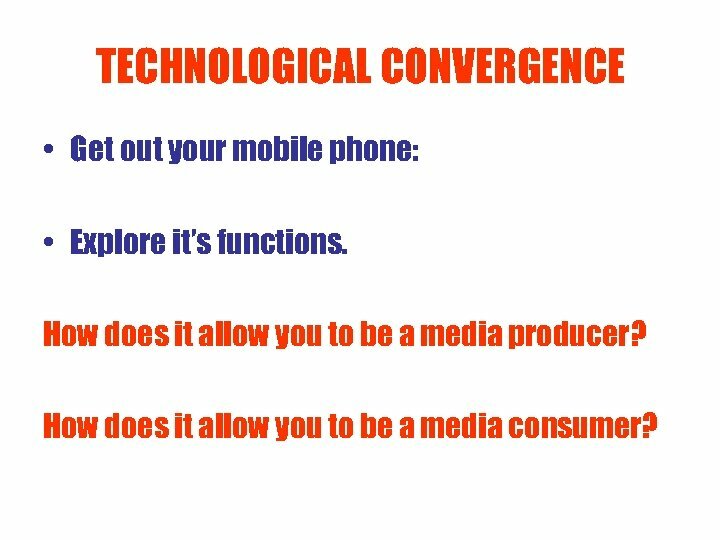 TECHNOLOGICAL CONVERGENCE • Get out your mobile phone: • Explore it’s functions. How does it allow you to be a media producer? How does it allow you to be a media consumer? 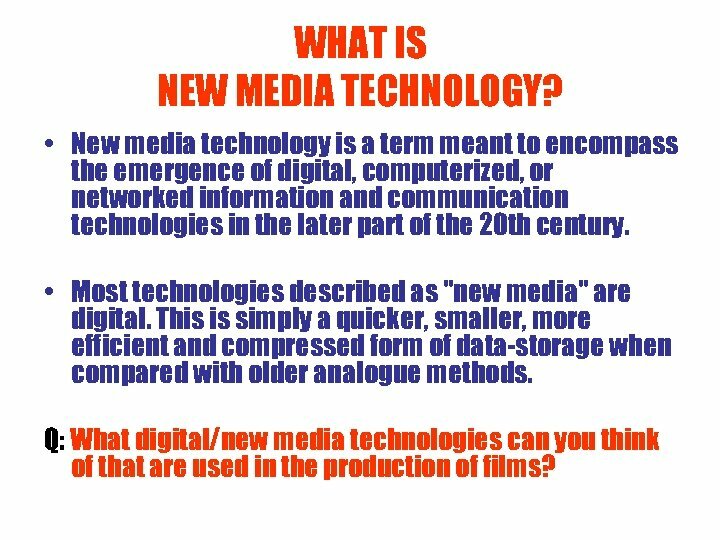 WHAT IS NEW MEDIA TECHNOLOGY? • New media technology is a term meant to encompass the emergence of digital, computerized, or networked information and communication technologies in the later part of the 20 th century. • Most technologies described as "new media" are digital. This is simply a quicker, smaller, more efficient and compressed form of data-storage when compared with older analogue methods. Q: What digital/new media technologies can you think of that are used in the production of films? OLD MEDIA TECHNOLOGY? Before the introduction of digital technology all films were shot on film cameras like this one. The film would be recorded onto big reels of 8 mm, 16 mm or 35 mm film. Once the filming was completed, it would be editing on a machine like this one (a moviola). The editor would literally have to cut and paste the film together frame by frame. Special effects were primitive and had to be created by the props department. They often looked very unrealistic, barely representing reality. Producing a film before New Media Technology was far more time consuming and expensive. Q: Why? 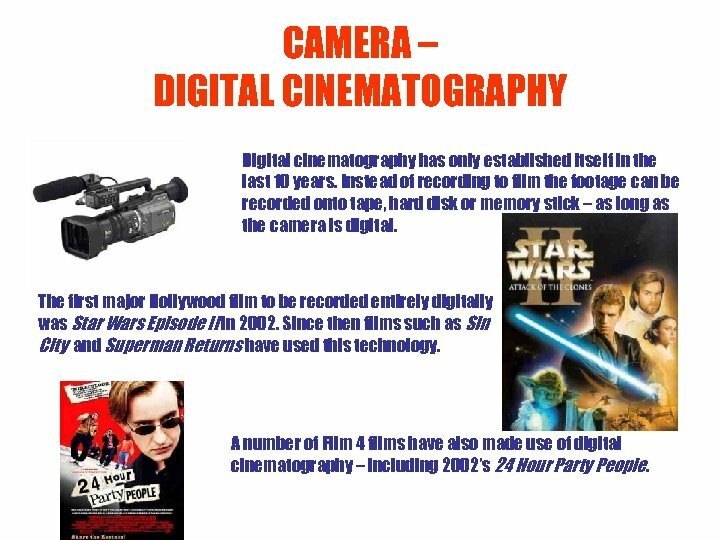 CAMERA – DIGITAL CINEMATOGRAPHY Digital cinematography has only established itself in the last 10 years. Instead of recording to film the footage can be recorded onto tape, hard disk or memory stick – as long as the camera is digital. The first major Hollywood film to be recorded entirely digitally was Star Wars Episode II in 2002. Since then films such as Sin City and Superman Returns have used this technology. A number of Film 4 films have also made use of digital cinematography – including 2002’s 24 Hour Party People. CAMERA HD & 3 D HD video is an upgraded version of digital video. It has a higher resolution (meaning more DPI or dots per inch). By having a higher DPI the picture quality is far higher than normal DV and retains a higher quality picture on a large screen. However, whilst being far easier to edit, even the highest quality HD DV is not as clear as a 35 mm or 70 mm film. There has also been a resurgence in 3 D film-making over the last ten years. 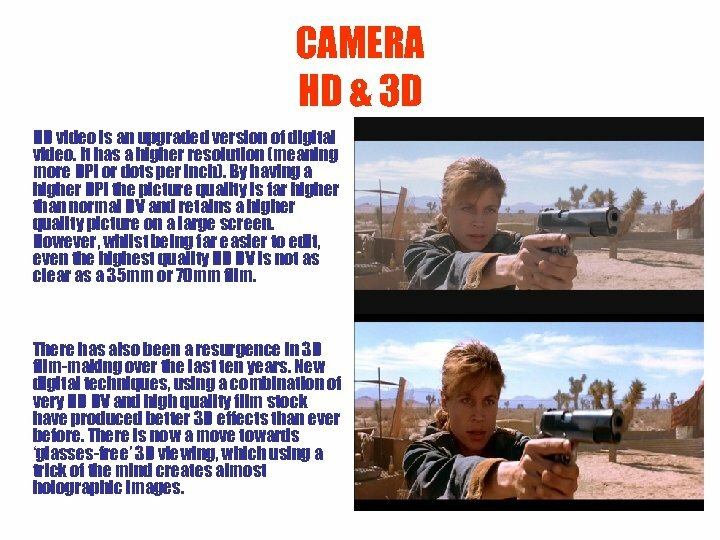 New digital techniques, using a combination of very HD DV and high quality film stock have produced better 3 D effects than ever before. There is now a move towards ‘glasses-free’ 3 D viewing, which using a trick of the mind creates almost holographic images. ADVANTAGES FOR THE FILM INDUSTRY • Portability – Digital cameras are far less bulky and difficult to transport than a traditional film camera. They are also far more manoeuvrable when shooting. • Sound Recording – Film cameras require sound to be recorded separately (hence the invention of clapper-boards to match sound to visuals). Digital cameras can record sound internally, halving the amount of equipment needed to record a film. 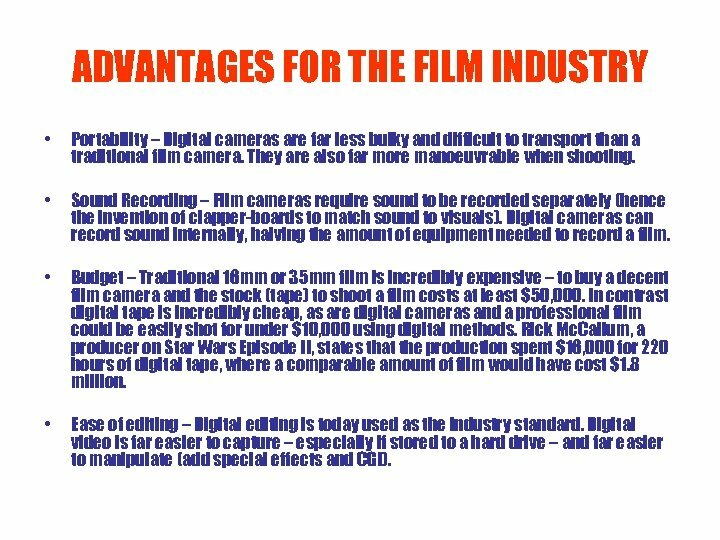 • Budget – Traditional 16 mm or 35 mm film is incredibly expensive – to buy a decent film camera and the stock (tape) to shoot a film costs at least $50, 000. In contrast digital tape is incredibly cheap, as are digital cameras and a professional film could be easily shot for under $10, 000 using digital methods. Rick Mc. Callum, a producer on Star Wars Episode II, states that the production spent $16, 000 for 220 hours of digital tape, where a comparable amount of film would have cost $1. 8 million. • Ease of editing – Digital editing is today used as the industry standard. Digital video is far easier to capture – especially if stored to a hard drive – and far easier to manipulate (add special effects and CGI). 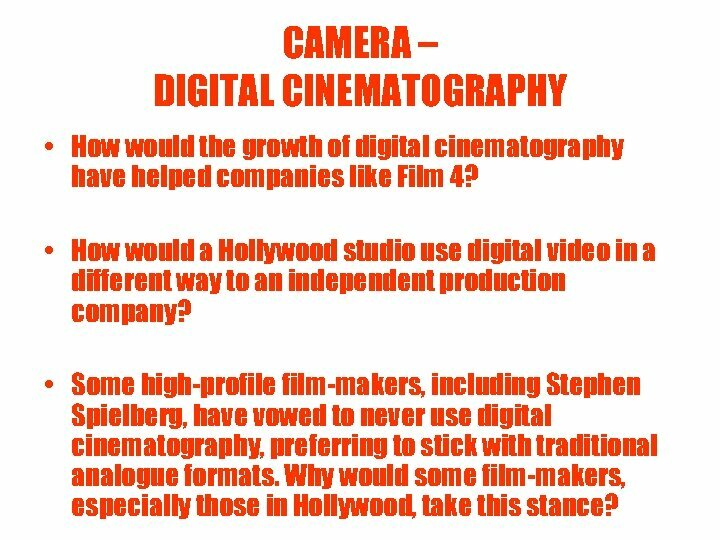 CAMERA – DIGITAL CINEMATOGRAPHY • How would the growth of digital cinematography have helped companies like Film 4? • How would a Hollywood studio use digital video in a different way to an independent production company? • Some high-profile film-makers, including Stephen Spielberg, have vowed to never use digital cinematography, preferring to stick with traditional analogue formats. Why would some film-makers, especially those in Hollywood, take this stance? EDITING – NON LINEAR EDITING Non-linear or digital editing computer-generates a virtual editing environment, allowing the editor to edit the film in any order they choose. This is unlike traditional linear methods which require the editor to literally cut and paste film sequences into a ‘line’. Programmes like Avid, Final Cut and I-Movie have revolutionised film editing. Rather than a large, expensive machine editing now only requires a reasonably high-spec PC or MAC. Production companies from the lowest budget independents to major Hollywood Studios use digital editing programmes on almost all their productions, which now include a variety of other features which allow the editor to manipulate the visuals and audio. 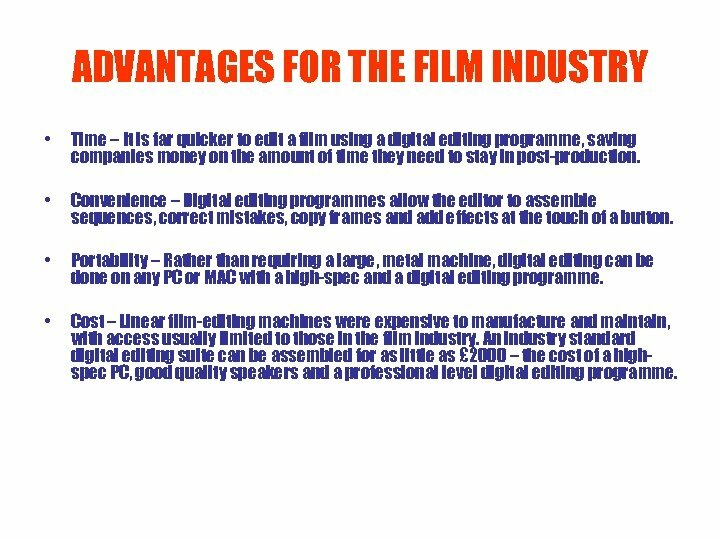 ADVANTAGES FOR THE FILM INDUSTRY • Time – It is far quicker to edit a film using a digital editing programme, saving companies money on the amount of time they need to stay in post-production. • Convenience – Digital editing programmes allow the editor to assemble sequences, correct mistakes, copy frames and add effects at the touch of a button. • Portability – Rather than requiring a large, metal machine, digital editing can be done on any PC or MAC with a high-spec and a digital editing programme. 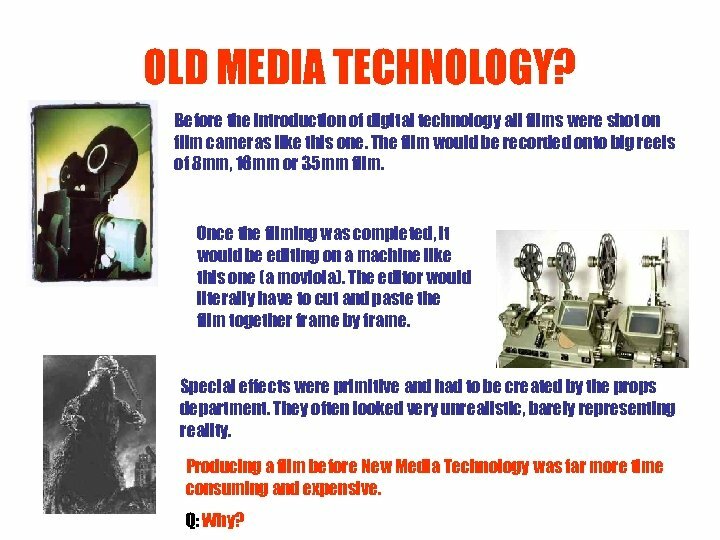 • Cost – Linear film-editing machines were expensive to manufacture and maintain, with access usually limited to those in the film industry. An industry standard digital editing suite can be assembled for as little as £ 2000 – the cost of a highspec PC, good quality speakers and a professional level digital editing programme. 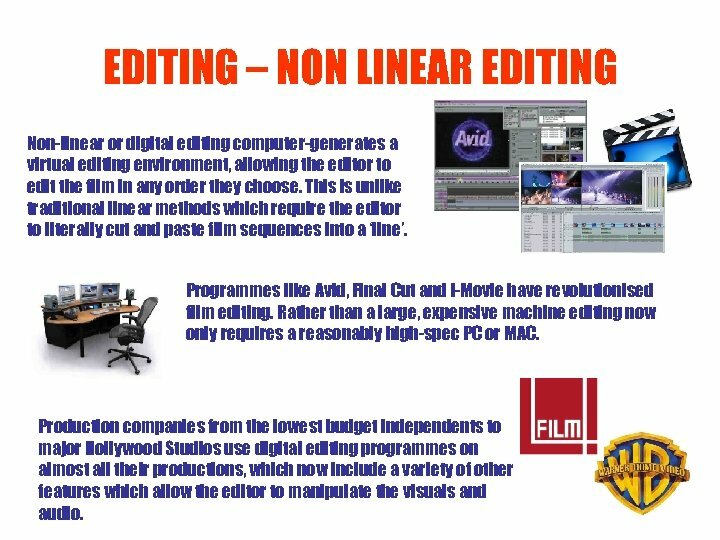 EDITING – NON LINEAR EDITING • How would the growth of digital editing have helped companies like Film 4? • How might editing actually be made more difficult or complicated by using a computer programme? 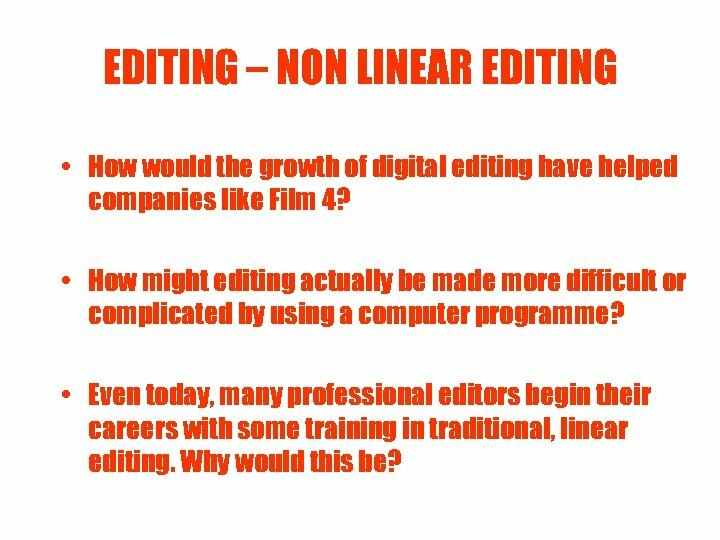 • Even today, many professional editors begin their careers with some training in traditional, linear editing. Why would this be? SPECIAL EFFECTS - CGI Computer-generated imagery or CGI is the application of the field of computer graphics or, more specifically, 3 D computer graphics to special effects in films. The effects (characters, locations) are created on a computer using a virtual wireframe and then manipulated by the animator. The first major use of CGI came in 1991’s Terminator II: Judgement Day. Using CGI the T-1000 was shown to melt into liquid and morph into a variety of different people and shapes. 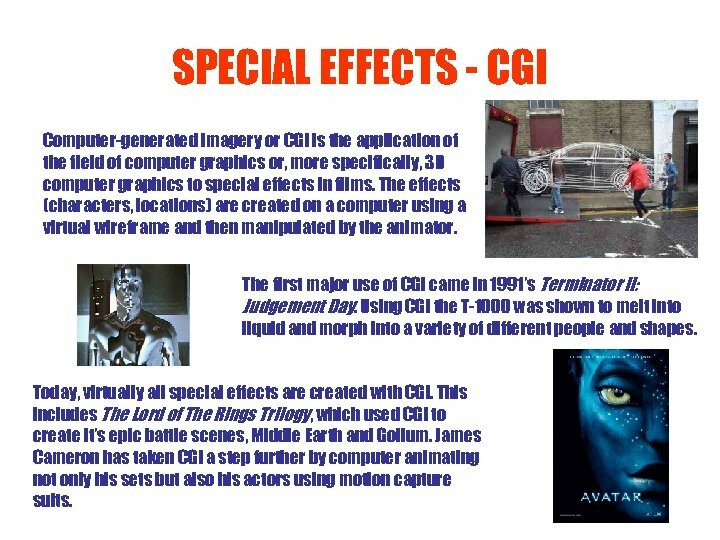 Today, virtually all special effects are created with CGI. This includes The Lord of The Rings Trilogy, which used CGI to create it’s epic battle scenes, Middle Earth and Gollum. James Cameron has taken CGI a step further by computer animating not only his sets but also his actors using motion capture suits. 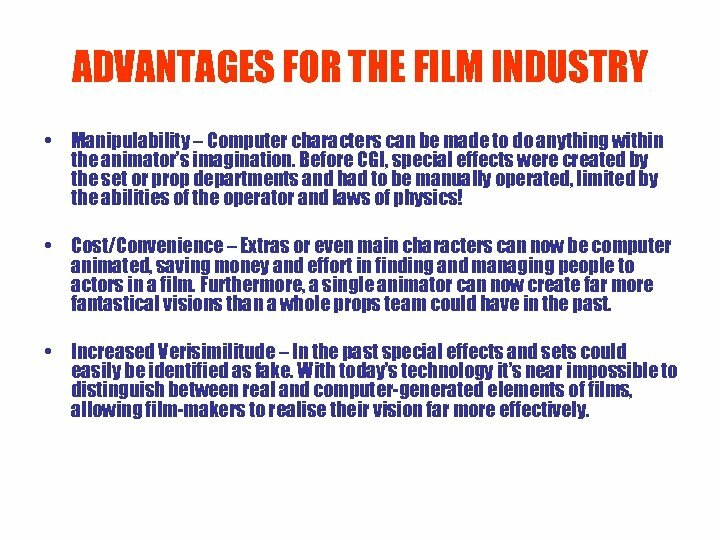 ADVANTAGES FOR THE FILM INDUSTRY • Manipulability – Computer characters can be made to do anything within the animator’s imagination. Before CGI, special effects were created by the set or prop departments and had to be manually operated, limited by the abilities of the operator and laws of physics! • Cost/Convenience – Extras or even main characters can now be computer animated, saving money and effort in finding and managing people to actors in a film. Furthermore, a single animator can now create far more fantastical visions than a whole props team could have in the past. • Increased Verisimilitude – In the past special effects and sets could easily be identified as fake. With today’s technology it’s near impossible to distinguish between real and computer-generated elements of films, allowing film-makers to realise their vision far more effectively. 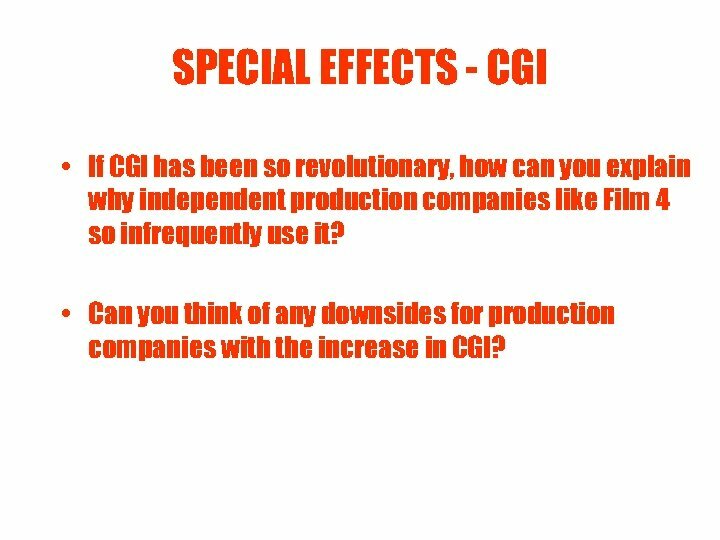 SPECIAL EFFECTS - CGI • If CGI has been so revolutionary, how can you explain why independent production companies like Film 4 so infrequently use it? • Can you think of any downsides for production companies with the increase in CGI? IMPACT ON AUDIENCE? • How will the use of digital technology have impacted on how audiences experience films? • How has the proliferation and relatively low cost of digital production equipment blurred the lines between film audiences and film producers? 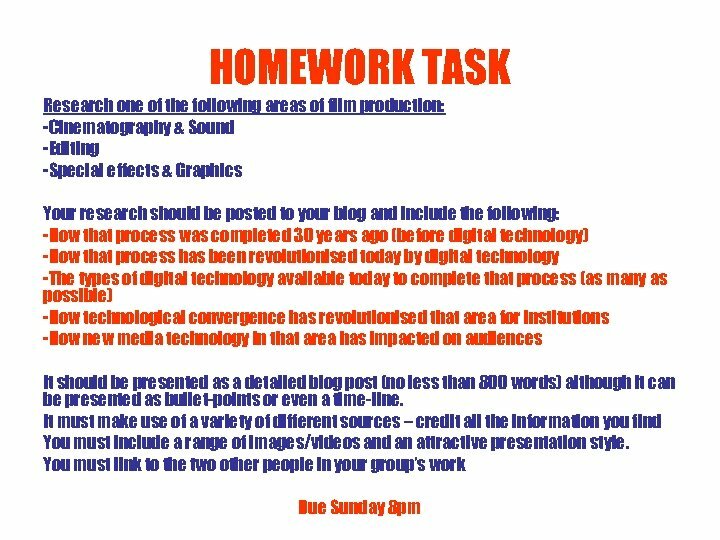 • How might the internet allow film audiences to influence films whilst they are still production, in a way they would never have been able to before? 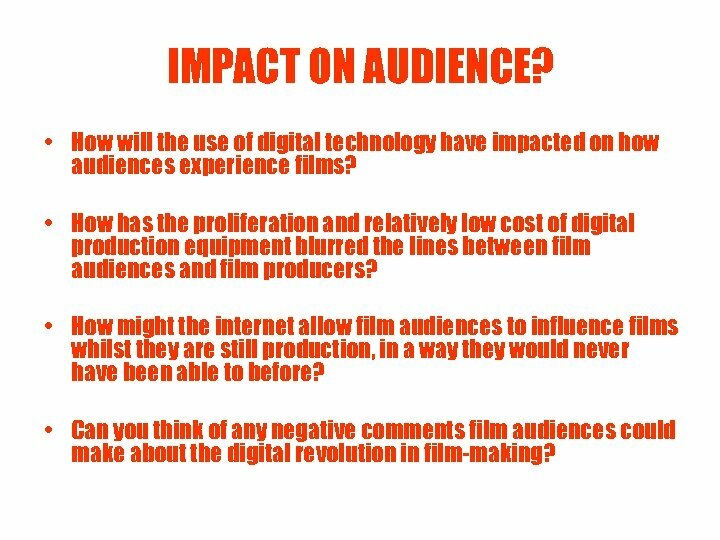 • Can you think of any negative comments film audiences could make about the digital revolution in film-making? 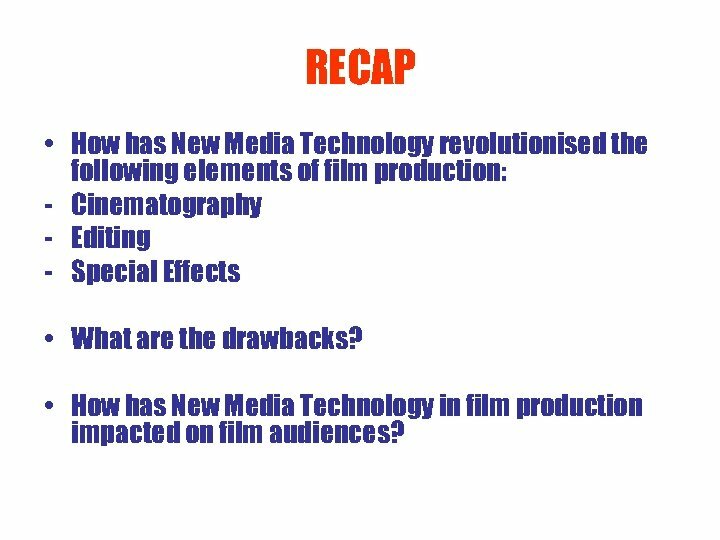 RECAP • How has New Media Technology revolutionised the following elements of film production: - Cinematography - Editing - Special Effects • What are the drawbacks? 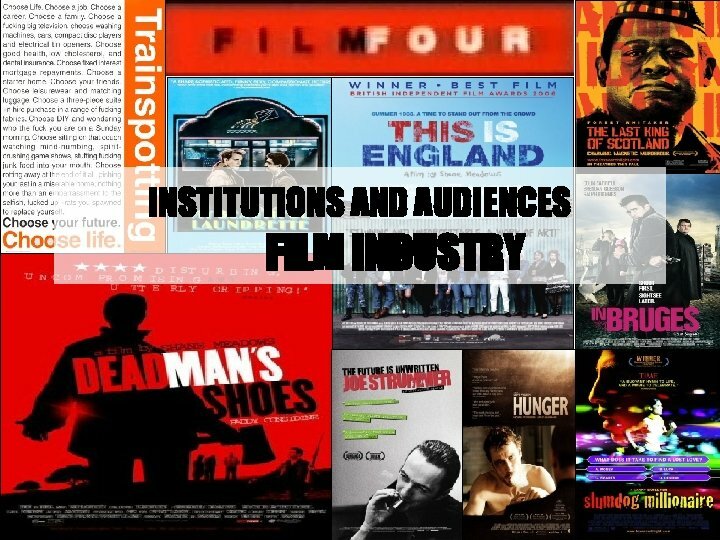 • How has New Media Technology in film production impacted on film audiences?